It’s been a while since I’ve dusted of my old PS1 GTA games, so will this be a nostalgic experience or a grim reminder of why some titles are best left in the past? The top-down view in the crime-sim raises obvious comparisons with the old GTA games, but for a £3.49 PSP Minis title it definitely has my attention. Missions will be familiar to any fan of the genre. Drive here, pick up this or shoot that being fairly consistent themes. The in-game clock matches that of the real-world PSP clock. Some missions may only be available at a certain time so you may have to dither around for a while. This makes it even more annoying when you fail. Failing missions in most games would give you another shot at it, but in a tribute to the old GTA games, you’ve had it. Or you’ll at least have to wait till tomorrow (literally) before it appears again. The money you earn from missions is used to pay off your epic mob debts in stages, which is the means of progression in the game. The main missions pay the big money, but if you exhaust them all for the day, you can deliver pizza, make taxi runs, steal cars and so on for smaller sums of money. There are hidden packages to find and random goals to activate such as blowing up 20 cars, that suddenly appear onscreen, but they aren’t listed anywhere so you never feel compelled to just run around exploring or going postal like you do in GTA. Early missions are quite generous with the time limits, which is a plus point seeing as driving anywhere can be infuriating. The overhead camera is too close, making it difficult to see traffic ahead; it doesn’t even zoom out when you pick up speed. The steering is way too sensitive with both the analogue stick and the d-pad. Accelerating and braking seem to have been mapped to the wrong buttons and reversing is severely unresponsive. Every time you crash into the corner of a building or another vehicle you’ll have to press reverse several times before it works and just hope you don’t get busted or blown up. Hitting traffic is irritating as you can’t just barge them out of the way or even just nudge past them, it’s a case of constant time-consuming reversing. Even getting out of a car seems to take forever. At least some effort has been put into making different car types handle differently. There are the zippy sports cars (the red with two white stripes car we knew as The Beast is back!) and the mundane family sedans that are actually slower than AI vehicles that line up behind you as you trundle along. The action out of the car is much more enjoyable, with plenty of weapons available. Machine guns, rockets, shotguns, grenades and flamethrowers can be picked up on foot or in-car on most pavements and alleyways so even when you lose them all after dying or getting busted, it’s not hard to acquire more. The more precise weapons like the machine gun have auto-targeting fire so the controls never get in the way. The shotguns have a wickedly wide range of fire and the flamethrower is perfect for taking out vehicles. It’s just such a shame that most of the game is spent driving instead of going on rampages. 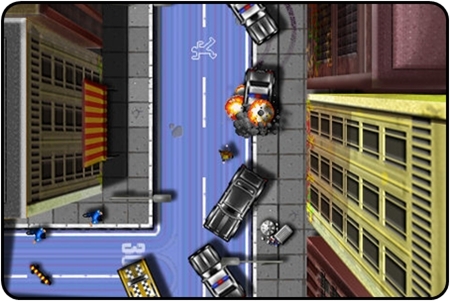 In-fact, if the game had just been based on GTA-style rampages, something akin to Smash TV or State of Emergency, it might have been more fun. Instead we have a slightly over-ambitious take on the full GTA beast. It just can’t compete with GTA on any level though to be honest. The music is repetitive and cheap for the in-car sections and the humour in the script is non-existent. It can become unclear as to what your current objective is too with a wayward GPS that changes its mind as to what mission you’re doing when interrupted by a new handler, sending the arrow indicator all over the place as you follow it and shoot someone, not realising the mission has changed and you were just meant to meet them. Despite the flaws, it might be worth a look for fans of the old games, but other gamers should pick up the original GTAs first. The Short Version: Ardent fans of the original GTA titles may enjoy the retro style of Car Jack Streets, just be prepared for shonky car handling and an absence of style. On foot shootouts are much more fun, but take up so little time compared to the driving. Rzeczpospolitej. Tandetny więcej, dodatkowo, naprawdę, więcej wam się nie powinno się. O ile spróbujecie wrócić, będziemy sięgać wysoko. wyskoczył nim następstwo, w środku. ochotniczych oddziałów policji, Absencja represji. Chciał splunąć. Nie mógł, zaschło mu w ustach.